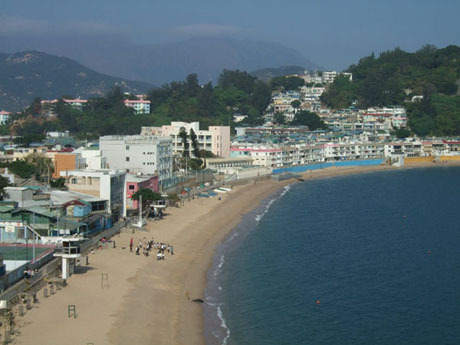 Cheung Chau (Long Island) is located 12km south-west of Hong Kong Island close to the Chi Ma Wan Peninsular of Lantau Island. The small dumbbell shaped island, approximately 2.5 kms in length, effectively comprises two granite hills linked by a narrow central causeway. It has a population of around 24,500 most of which live in the central part of the island. This endearing island which is full of colour, character and contrasts will prove something of a surprise to many visitors and is easily reached and well worth a visit. (a) CENTRAL (HONG KONG ISLAND) - CHEUNG CHAU. Operated by First Ferry. 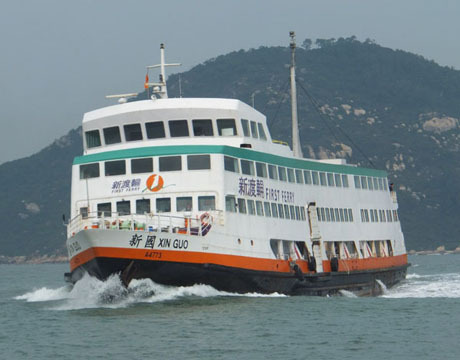 There are two types of ferry in operation on the HK Island – Cheung Chau route. 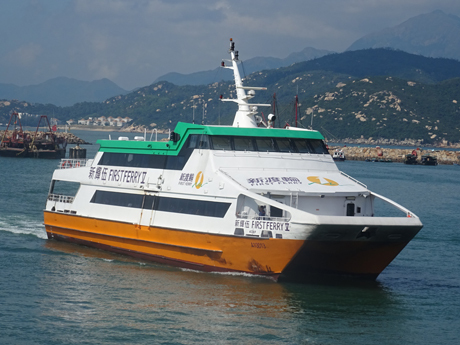 "Fast Ferry", high-speed catamarans with a passenger capacity of between 200 and 400 make the journey in 35 minutes and large triple deck “Ordinary Ferry" with a passenger capacity of between 1200 and 1700 which takes 55 minutes to reach Cheung Chau. Unless time is an important consideration most visitors will find the “Ordinary Ferry” preferable. 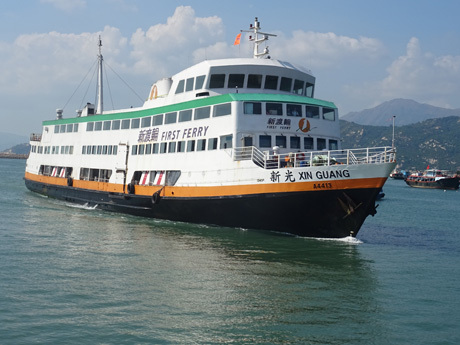 These ferries have decks which passengers can wander around, an air conditioned deluxe class on the top deck with an outdoor sun deck and there are excellent views of Victoria Harbour, outlying islands and all types of shipping along the journey. Passengers wishing to travel deluxe class must use Octopus Card at the deluxe class turnstile at the piers to obtain ticket or purchase deluxe class ticket at the pier ticket office. A previous facility to upgrade to deluxe class after boarding was discontinued in late 2014. Whilst Fast Ferries offer a quicker journey, sealed passenger cabin windows and sea spray that visibility is often poor. Ferries operate at roughly 30 minute intervals during the daytime and evening and there are also a few sailings between midnight and 6am. On Sundays and Public Holidays ferries operate at an increased frequency. 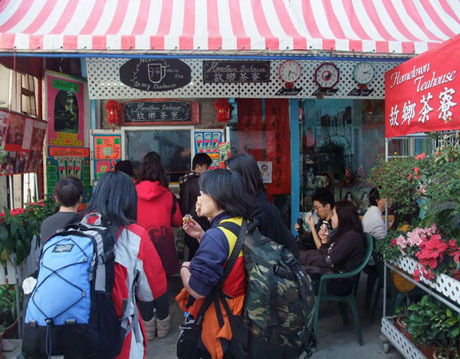 Average daily patronage of the Central - Cheung Chau service during 2015 was 26,315. 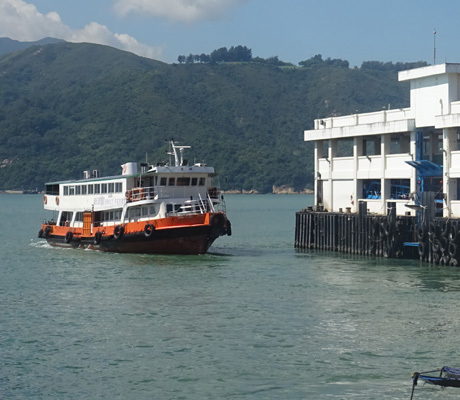 (b) INTER-ISLAND FERRY service which links, Peng Chau, Mui Wo and Chi Ma Wan on Lantau, and Cheung Chau. Operated by First Ferry. 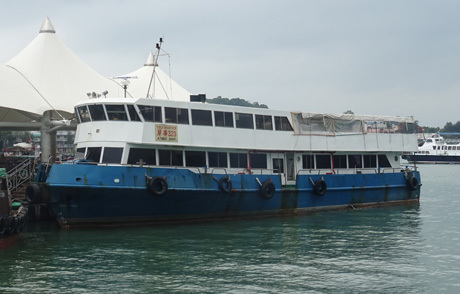 The service operates from 6am until midnight, calling at Cheung Chau about every two hours and utilises a double-deck boat with a capacity of about 350 passengers. There is no service to Chi Ma Wan after 8-30pm and not all daytime services call at Chi Ma Wan. (c) ABERDEEN - CHEUNG CHAU. Service introduced August 2015. Operated by Maris Ferry Service. Seven sailings each way on weekdays and twelve sailings each way on weekends and public holidays. 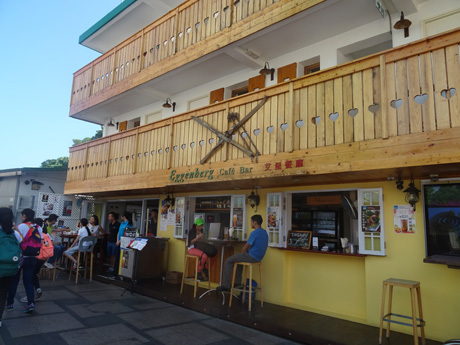 Operates from Cheung Chau Public Pier, adjacent to Cheung Chau Ferry Pier. Journey time - 55/65 minutes. 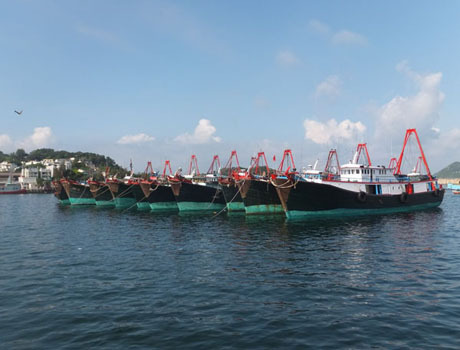 The island has a busy harbour and large fishing fleet and trawlers can usually be seen berthed alongside craft of all descriptions including, sampans, junks, kaidos and houseboats. The ferry pier is on the west side of the island next to the Praya which is lined with seafood restaurants and small shops. 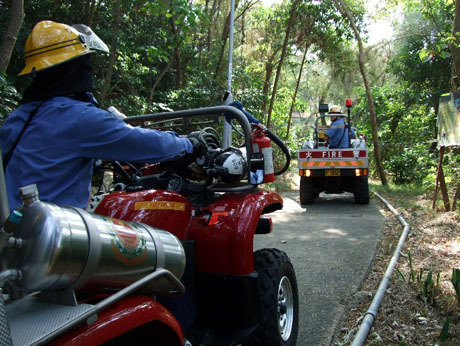 Apart from some small police, fire and ambulance vehicles the only other powered vehicles on the island are motorised carts weaving along the narrow streets. 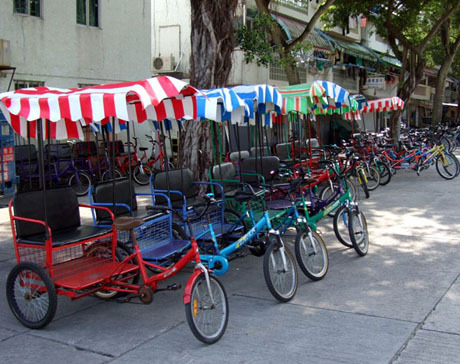 Cycling is popular and two seat tricycles with sun canopies can be hired from shops on the harbour side on Praya Street and Tai Hing Road and these are an enjoyable way to explore the flat western side of the island. 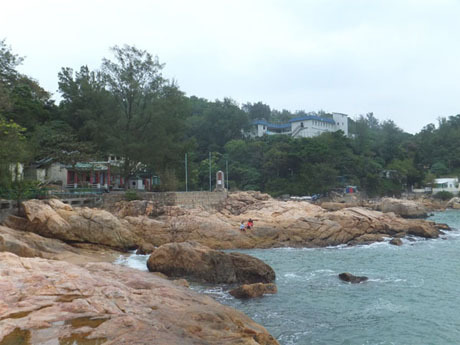 On the opposite side of the causeway on the eastern side of the island is the sandy Tung Wan Beach and at just round the corner beyond the Warwick Hotel at the southern end of the beach is the attractive Kwun Yam Bay and Cheung Chau Windsurfing Centre. 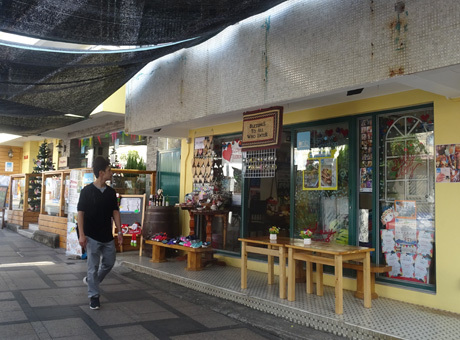 The narrow streets between the ferry pier and Tung Wan Beach are packed with restaurants and shops selling all types of goods including dried seafood, meats, fruit and vegetables, clothes, electrical goods, herbal medicines, jewellery, hardware and flowers. Away from the central causeway the island becomes much quieter and very scenic. 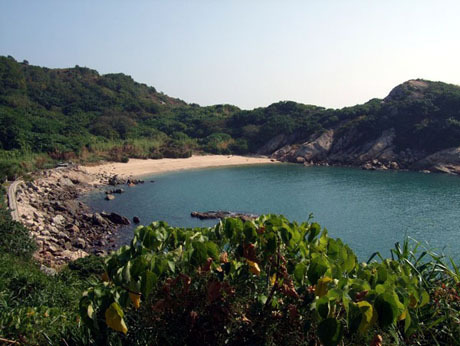 There are craggy hillsides, quiet bays and beaches, rocky outcrops, temples, a pirates cave and even a “Mini Great Wall”. 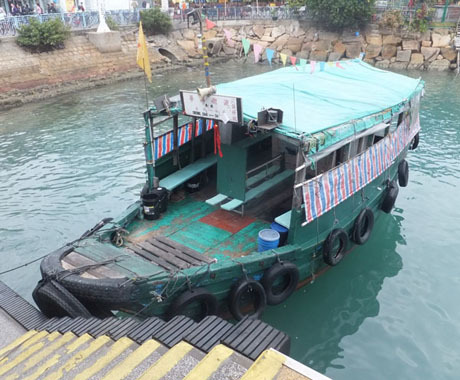 HARBOUR SAMPAN RIDE - A sampan ferry service from the public pier (adjacent to the main ferry pier) through the harbour to Sai Wan Pier which is within easy walking distance for the Tin Hau Temple and Cheung Po Tsai Cave. The journey takes around 10 minutes and is a good way to see the harbour activity and south west side of the island. The ferry operates at approximately 20 minute intervals from 07-00 to 20-30 daily with increased frequency on Sundays and Public Holidays to meet demand. The fare is HK$5 each way for visitors (HK$3 for locals). In addition to the ferry service, there are also usually several sampan operators touting for business at the public pier. FAMILY TRAIL WALK - A walk around at least part of the island is a “must” and there is a signed family trail around the island. The walk around the whole island takes about three and a half hours but the walk around the southern half of the island is the more interesting and takes about two hours. 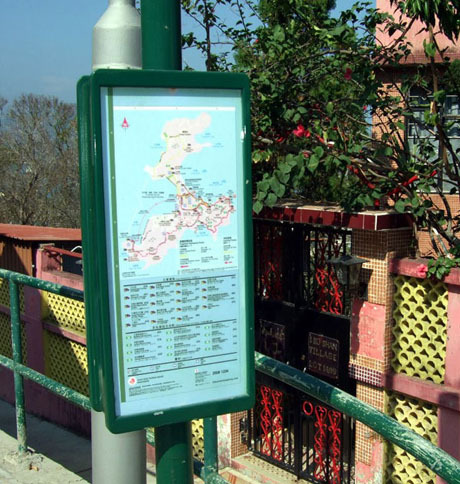 There are tourist information boards at various points around the island showing the route and present location. From the ferry pier walk along Tung Wan Road (almost next to Circle K convenience store) to Tung Wan Beach and on the way (near Park N’Shop supermarket) look out for the sacred Banyan Tree with its shrine. 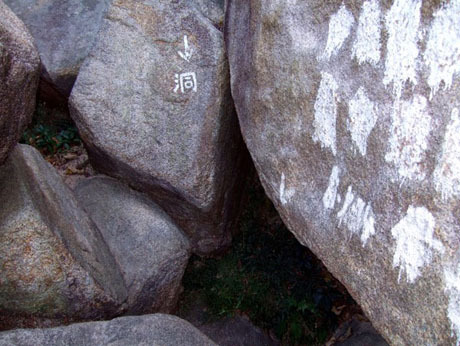 Follow the path along the beach below the Warwick Hotel where there is an ancient 3000 year old rock carving. 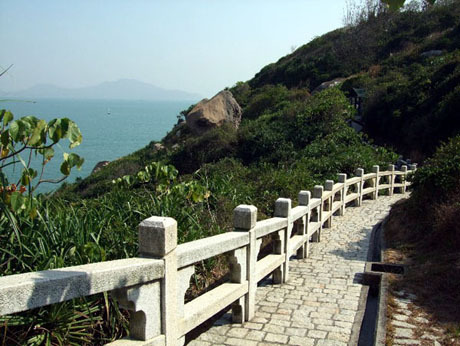 Continue along the path, past the rock carving to Kwun Yam Beach where the Cheung Chau Windsurfing Centre is located and where Hong Kong's only Olympic medallist, Lee Lai-shan, who won gold for windsurfing in Atlanta in 1996 trained. From the beach climb the steps inland and at a junction of several paths follow the Mini Great Wall. 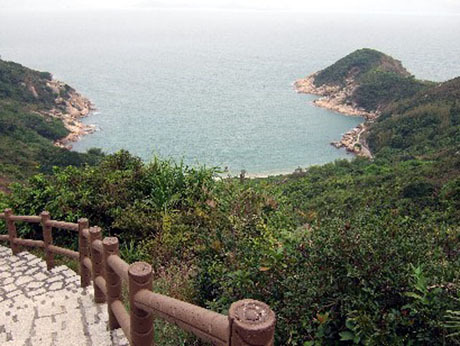 This is something of a misnomer, being simply a path, but it follows a scenic headland, passing Loaf Rock and Human Head Rock, and has wonderful scenic views across to Lamma Island and the southern coast of Hong Kong Island. Climb the steps up to Fa Peng and on reaching a modern Mediterranean style housing development at Fa Peng Knoll head left along Don Bosco Road, the path that leads to Nam Tan Wan. 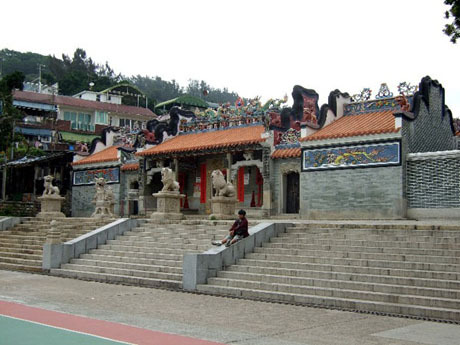 Keep on the path that leads to the secluded rocky beach where there is a Tin Hau Temple. Continue along the path past the temple and end of the beach and climb the steps to rejoin Don Bosco Road. Head left and shortly the path joins Peak Road. At this junction head left again along Peak Road through a residential area with views across the densely populated central causeway until reaching a convergance of paths at a pavilion. Here follow the path (Peak Road West) on the left which leads uphill alongside a school and then further along through the large cemetery and crematorium. Beyond the crematorium is a path on the left leading down to the secluded and mostly deserted Pak Tso Wan, known to local westerners as "Italian Beach" and then round the coastline past Reclining Rock to the Cheung Po Tsai pirates cave. Pak Tso Wan "Italian Beach"
The relatively agile can follow this path. When the tide is high some climbing over rocks across Po Yue Wan (the small bay beyond Reclining Rock) is required. Look for the concrete footstep markers across the rocks. Note - the path leading around Po Yue Wan has been closed for safety reasons but is still passable with care. An alternative is to simply keep following Peak Road West instead of taking the path to Pak Tso Wan. Peak Road West joins the path leading to Cheung Tsai Po Cave at a barbecue area. Just beyond Po Yue Wan it appears that the path reaches a dead end but don’t be tempted to turn back. The narrow path actually disappears down between some rocks and steps climb through the rocks to join the path leading from Peak Road West down to the Cheung Po Tsai Cave. 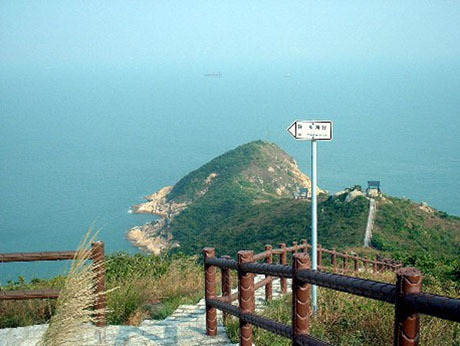 From the cave return to Peak Road West then follow the path leading to the Tin Hau Temple and continue along the harbour side path from Sai Wan along the promenade and back to the ferry pier or if preferred take the kaido ferry from Sai Wan Pier through the harbour to the ferry pier. EXTENDED WALK - The walk can be extended to the whole island by continuing along the the harbour side past the shipyard area along Cheung Kwai Road where there is a sandy beach and views across the busy Adamasta Channel and ferries scurrying between Hong Kong and Macau and Pearl River Delta ports. Just past a modern residential development Scenic Garden climb follow Cheung Pak Road uphill and then a path on the left which leads to a helicopter landing pad and spectacular views down to Tung Wan Tsai (Coral Beach) below. 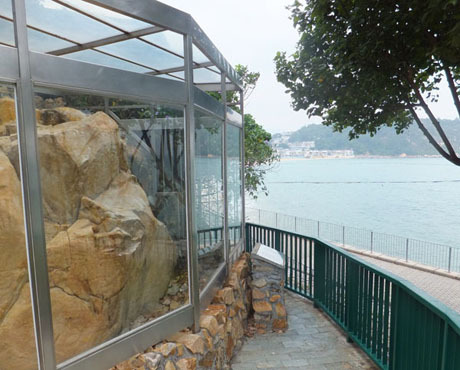 It is possible to follow the path down to the beach below and walk across the pebbly beach from where another path and steps lead back up to Cheung Pak Road via a series of pavilions. 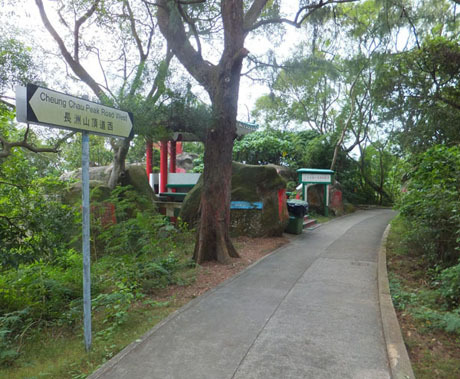 At the top of Cheung Pak Road before the reservoir follow the path leading back towards the centre of the island past another cemetery and Tin Hau Temple before reaching the Pak Tai Temple, focal point of the Bun Festival. From there it’s a short walk along either Tung Wan Beach or the harbour side back to the ferry pier. B&B CHEUNG CHAU. 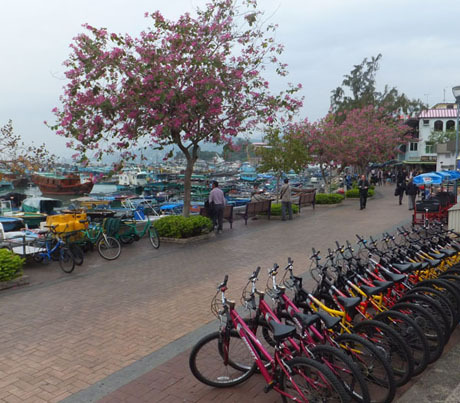 Since opening in 2006 B&B Cheung Chau has established itself as the island’s leading accommodation provider, raising standards to new levels as well as transforming tourism on the island, with its “East meets West” village theme. 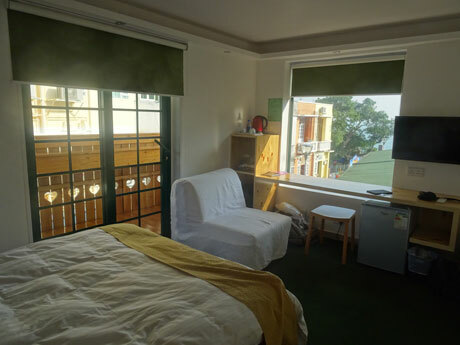 There are 39 modern, spotless rooms with 93 beds including suites, family rooms and group rooms in four premises in two areas of the island on Tung Wan Road, just 2 minutes walk from the ferry pier, and at Pak She, near Pak She Temple, famous for being the venue for the Cheung Chau Bun Festival. 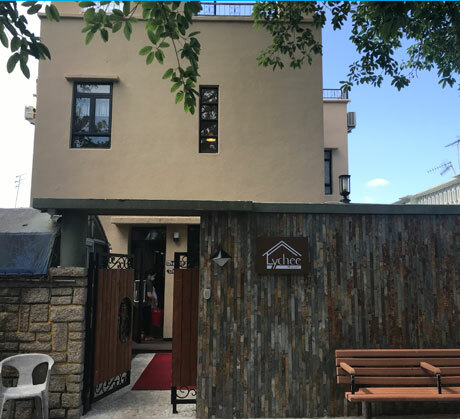 A further 12 serviced apartments and additional hotel rooms are located in its Lychee Hotel on Police Station Path, opened 2018. Rates include breakfast and wi-fi access in rooms, its main building on Tung Wan Road has roof garden with panoramic views and some rooms have balcony and sea view. The B&B’s Eggenberg bar/cafe, opened in 2014, and now under the supervision of top chef Andy, has quickly earned a reputation as one of the island’s best restaurants with its welcoming ambience and extensive menu of first class Asian and Western meals with Austrian and German specialities as well as a wide range of wines and beers. Guests can enjoy a 20% discount on meals. 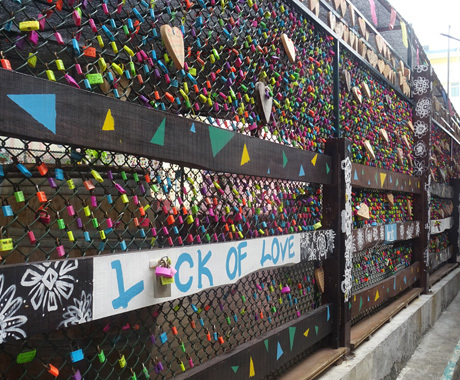 Visitors can dedicate messages to their loved ones and friends at the B & B’s Love Lock Garden opposite its culture workshop on Tung Wan Road. The B & B also operates a shop selling wines and speciality beers including craft beers. Perhaps B & B’s greatest asset is its welcoming, friendly staff who go out of their way to ensure guests comfort and satisfaction and maintain its popularity among locals and overseas visitors alike. 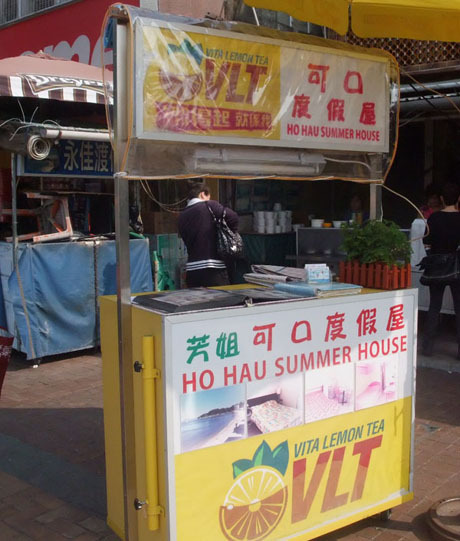 One of about 15 accommodation stands located outside Cheung Chau Ferry Pier. Here visitors can browse display albums of various accommodation before making a choice. 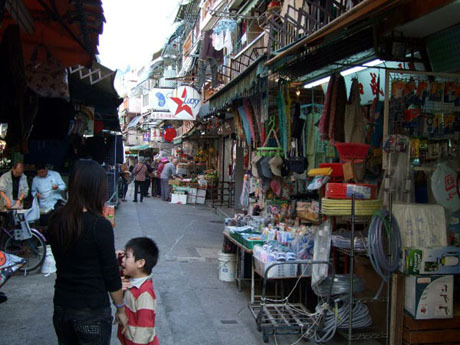 SAN HING PRAYA STREET ACCOMMODATION STANDS located by the ferry pier are operated by various property owners and open daily, often until midnight or later. Here you can view pictures of various types of inexpensive apartments or rooms before making your choice.